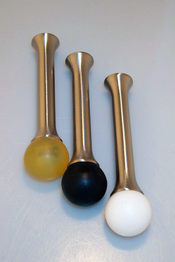 tipped with Gold, Black or White rubber balls. One door stop in matching finish is included with purchase of the complete Entry System. These are part of the regular Myterra product line, NOT closeout items, and are available for individual purchase here at full retail pricing.